She's showing him their real home for the first time. 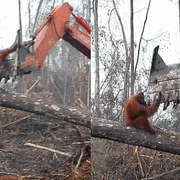 After an orangutan named Maili was kept captive for several years of her early life at a house in Indonesia, she had to learn how to become an orangutan again. When she was 7 years old, people from International Animal Rescue (IAR) brought her to their rescue center in Sungai Awan, Ketapang, so that she could do just that. In the three years Maili spent at the rescue center, so much happened. Not only was she allowed to make a home on a special island where she could remember her natural instincts — like climbing, foraging for food and building nests in trees where she could sleep — she also met some very important new friends. She bonded particularly with one male orangutan. Rescuers were about to begin the process of releasing Maili back into the wild when they gave her a physical exam and realized there was a little surprise on the way. Several months later she gave birth to a little boy orangutan. Her release was delayed so people could be sure that Maili and her baby Osin would be safe. 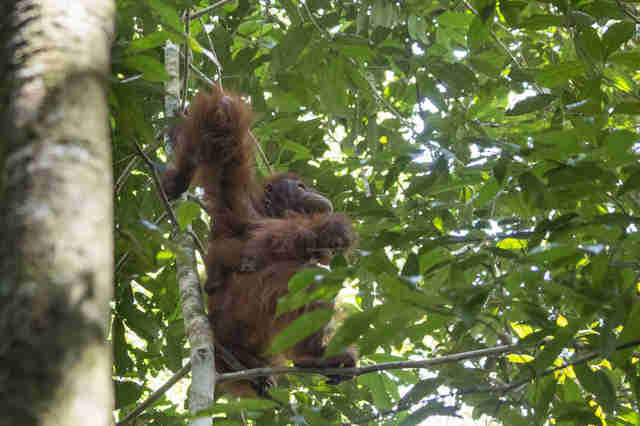 "Once her baby had been born, the team resumed monitoring Maili which confirmed that she was exhibiting good natural behavior and that her son was developing well," IAR wrote in a press release. It was time to let Maili and little Osin go. 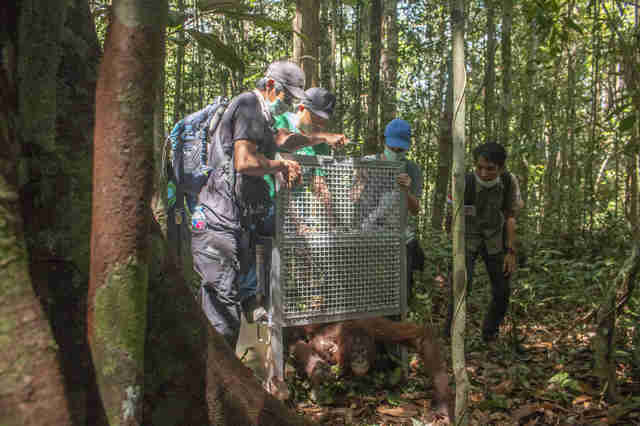 Earlier this month, rescuers took the arduous four-hour trek through the jungle, after a four-hour drive. Twelve local residents helped carry the crate containing Maili and Osin across streams and through underbrush to arrive at the right spot. Little Osin, who is now 14 months old, held onto his mom as Karmele Llano Sanchez, program director of IAR Indonesia, opened the crate. 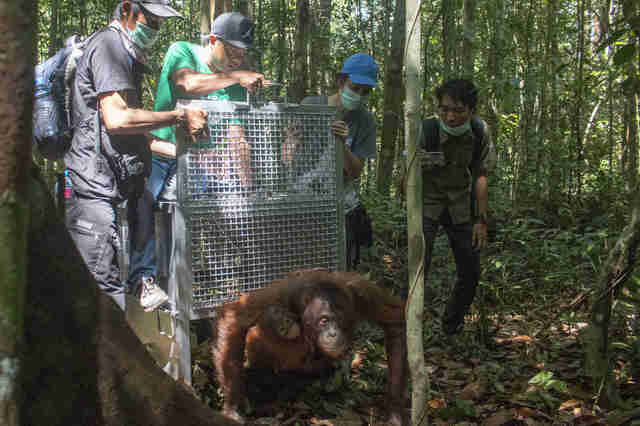 Several rescuers watched as Maili took her first few steps onto the land that would be her new home in the wild. Maili immediately selected a nearby trunk to begin climbing. She went up and up and settled on a branch in the canopy to look around. Maili and her baby did give their rescuers one last glance before moving farther up. She and Osin will continue to be monitored by people in the area to make sure the little family is adjusting well to their new home. 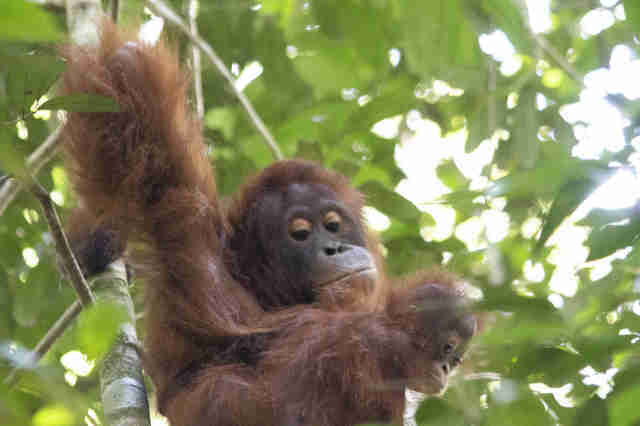 Osin will be able to grow up in the wild, learning how to climb, forage and make nests, just like his mom. 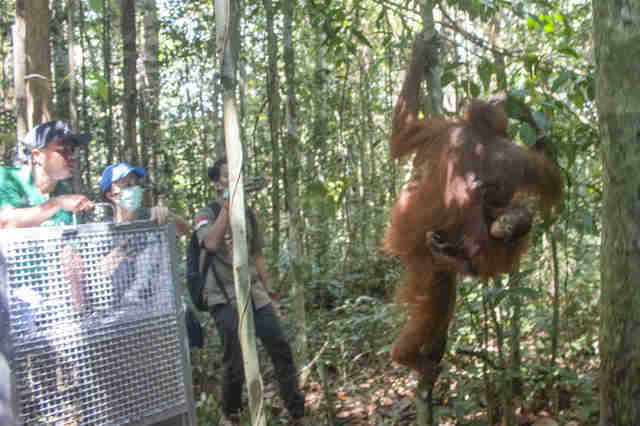 And hopefully this rare family will stay safe and strong, despite the threats, like habitat destruction and the exotic pet trade, that have led all three species of orangutans to be critically endangered. 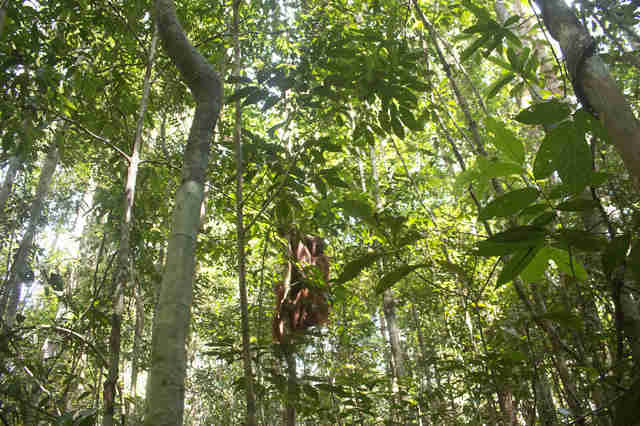 "It is so uplifting to witness Maili and Osin climbing the trees in their natural habitat," Sanchez said. "I am thrilled they can both be returned to their rightful home." You can help protect orangutans like Maili and Osin by making a donation to IAR.